The aim is to increase awareness of the fatal cancer that takes so many Australians lives each year. 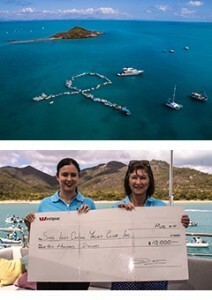 Maria Dwyer & Lizzie Wickham from Oceanic Marine Risks presented the Shag Islet Cruising Yacht Club with a donation of $10,000, which assisted in the raising of $82,000 over the 3-day event. logo. The aim is to increase awareness of the fatal cancer that takes so many Australians lives each year. Maria Dwyer & Lizzie Wickham from Oceanic Marine Risks presented the Shag Islet Cruising Yacht Club with a donation of $10,000, which assisted in the raising of $82,000 over the 3-day event. 700 members attended the event in a bid to raise money for the foundation with raffles, auctions and events taking place. Ken Thackeray, the founder of the SICYC said his goal is to spread the word throughout Australia and hopes that on the last Saturday of August each year other organizations will hold hands across the blue to raise the awareness of Prostate Cancer and the effect it has on many Australians and their families.